» A Western Movie Review by Jonathan Lewis: HORIZONS WEST (1952). A Western Movie Review by Jonathan Lewis: HORIZONS WEST (1952). HORIZONS WEST. Universal International, 1952. Robert Ryan, Julie Adams, Rock Hudson, Judith Braun, John McIntire, Raymond Burr, James Arness, Dennis Weaver, Frances Bavier, Tom Powers. Director: Budd Boetticher. Horizons West is a very good, albeit uneven, 1952 Universal Studios production directed by Budd Boetticher. 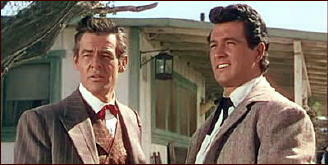 Set in and around Austin, Texas, after the Civil War and during Reconstruction, this Western tragedy stars Robert Ryan and Rock Hudson as the brothers, Dan and Neil Hammond. As the film progresses, Dan (Ryan) and Neil (Hudson) find themselves on opposite sides of the law, with the latter tasked with bringing in his criminal older brother back to town for trial, culminating in a final interfamilial showdown in a small Mexican town. Dan starts off as a seemingly good guy, but by the end, the man’s done gone bad, irredeemably so. The movie benefits from its strong coterie of extremely talented actors. Aside from Ryan and Hudson, the film also stars Raymond Burr, who brilliantly portrays Cole Hardin, a sleazily villainous gambler. There’s something about Burr’s character that’s so devious that one wishes that he weren’t killed off so abruptly. And then there’s the lovely Julia Adams (Creature of the Black Lagoon), who portrays Hardin’s wife. She inevitably falls in love with the increasingly arrogant and power-mad Dan Hammond, causing friction between Dan and Cole. Veteran character actor John McIntire portrays the stoic Ira Hammond, owner of the family ranch who watches with alarm as his son, Dan (Ryan) returns home from the war a defeated, but proud Confederate officer, only to morph into to a ruthless and corrupt Texas power player. Aside from the skillful acting, Horizons West makes excellent use of vivid and symbolic use of colors (Technicolor works extraordinarily well here) and numerous well-constructed lush interiors. Look for the scene in front of an Austin hotel when Dan Hammond is wearing a red tie and Mrs. Hardin is wearing also wearing red in her attire. It just works perfectly. In many ways, the plot is standard, almost cliché Western fare, replete with a soldiers returning home from the Civil War, a good guy gone bad, brothers in conflict, a corrupt and flamboyant Mexican general, cattle rustling, and a lynch mob. One can, however, view Horizons West less as a standard Western, and more as a quasi-Greek tragedy set in the American West, similar to Saddle The Wind, which I reviewed here. Similarly, one can interpret it as contemporaneous social criticism about how big money can corrupt otherwise good men. Indeed, by the time that the movie ends, the two overtly greedy lead characters, Dan Hammond (Ryan) and Cole Hardin (Burr), have both been killed by gunfire. 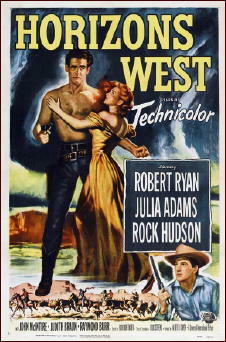 In contrast, in the final moments, the film’s most humble and hardworking characters are prospering in the bounty of the westward movement of people and cattle, hence the seemingly optimistic title of the film. 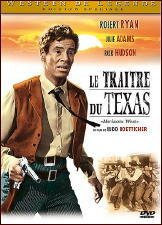 But to the extent that Horizons West is about the rise and tragic fall of Dan Hammond, the film’s French title, Le Traitre du Texas (The Texas Traitor), is more accurate in conveying the film’s classically tragic overtones. The film’s greatest flaw is in the fact that we never really get a full sense of what drives Dan Hammond to self-destruction, why he goes power mad. There’s almost no indication that something terrible happened during the war that explains his descent into villainy. There are, however, a couple of brief moments that may shed at least some light on the matter. Soon after Dan returns home from the war with his adopted brother, Neil (Hudson) and their family’s ranch hand, Tiny McGilligan (James Arness), he tells his parents that he finds Texas to be too quiet and refers to all the noise he heard during the Civil War. But that’s about the last he mentions of this. We never see Dan struggle with his wartime experiences, nor do we ever hear him explain to another character what drives him to cheat and to steal. The other instance is when Dan discusses finances with Ira, his father who still hasn’t paid off the debt on the ranch, something that Dan Hammond seems to find embarrassing. But again, it’s a brief exchange and one that isn’t much referred to later on. Still, Horizons West remains a better than average Western. Ryan, Hudson, and Burr are all great actors and it shows. The film’s strongest point is its extraordinary use of color. There are many scenes in which color, rather than dialogue, is the focal point. It’s a movie that explores one man’s descent into greed and violence, but nonetheless remains truly beautiful to behold. 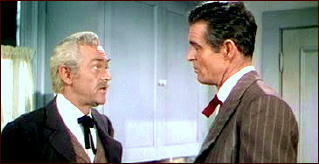 My problem here was that Dan seems to go bad largely because he is played by Robert Ryan who is so good at going bad. That and an ill defined ambition and anger over the South’s defeat are as close to an actual motive we get. I wish the story here was as good as the cast, direction, and production value. Even with that its a better than average film, just not as good as it could have been with a bit more effort put to story. 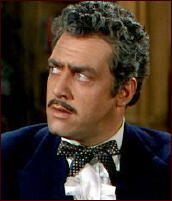 Raymond Burr’s abrupt departure from the movie was a huge loss, as far as I was concerned — and an unexpected one. Burr as a villain in the movies and his pre-Perry Mason days was superb — a man you loved to hate. I always did. Burr was excellent in this. From the first moment you see him, you know he’s going to be great as a bad guy. He’s a very different sort of bad guy than Ryan is. Ryan seems to portray the the type of bad guy who is wrestling with some sort of inner demon. Thank you for this terrific review! My guess as to why Ryan goes bad. Boetticher was a strongly pro-Civil Rights director. He made two films about men who fought for the Confederacy, who undergo total moral corruption and degeneration: Horizons West and Westbound. Boetticher likely saw the Confederacy as this unspeakably evil society that corrupted people who support it. Both films have good guy characters who provide “balance” by showing there were some good people on the Southern side; Hudson here, the town doctor in Westbound. But these don’t overrule the main point of the movies. Hey, Mike. Boetticher wrote neither Horizons West nor Westbound, and they were both big studio jobs. 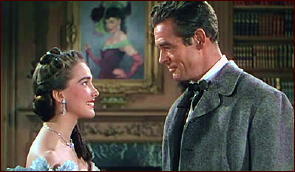 In the case of Westbound, Randolph Scott was finishing a WB deal and after the success, relatively speaking, of the so-called Ranown cycle, brought him along. As for Horizons West, he had a job and performed his task relatively well. Perhaps he did see things the way you say but adherence to the approved scenario, with a possible personal take or two, is what is up on screen. The stuff with Ryan is over done, overly theatrical and for momentary effect. In my opinion. Steve regarding Raymond Burr. When I was a small boy in the forties we all knew him on screen in Rutherford, New Jersey. He was always great. Years later, in the eighties, I actually got to know him somewhat, a very nice and accessible man. This is borderline a much better western than it actually turns out to be thanks to the lack of any real motivation for Ryan’s Dan. He seemingly goes bad mostly because Robert Ryan is so good at playing menacing bad guys, plus ambition, and ennui about the end of the war. He doesn’t even seem particularly angry, just bored with peace. I suppose that was true of some veterans of every war, but the film doesn’t even spend much time on that idea. But Ryan and Burr are evil, Adams lovely, and Rock holds his own with the veteran cast, the direction and production values high so this one is at least a B+ or A-. Seminole is indeed a fascinating movie. It is very strongly pro-Civil Rights. Weirdly, my 84-page article on Boetticher is apparently the only large scale critical study of Boetticher anywhere. There are no books on Boetticher in any language, as far as research reveals. The most important article on Boetticher is the chapter on his work in the book “Horizons West” (1969) by Jim Kitses. Professor Kitses named his book after the Boetticher film. The chapter on Boetticher is around 30 pages, plus photographs. The book covers many other directors of Westerns too. My article is full of lists, tracking Boetticher’s themes and techniques. This gives some idea of the depth and consistency of Boetticher’s pro-Civil Rights views. “Ride Lonesome: The Career of Budd Boetticher” by Sean Axmaker in the journal Senses of Cinema (2006). This piece is largely biographical. By contrast, Kitses’ article and my article are “critical”: They look purely at Boetticher’s FILMS and offer analysis. All the points made by Mike Grost regarding Budd Boetticher and his ‘civil rights’ viewpoint are so — they are also so or true in anyone’s films. Minorities are always treated either as scapegoats or respectfully. If there is an exception, I would like to know it. But, if my contention holds up to scrutiny, I don’t see how these attributes can be laid at the creative door of any single filmmaker. Mike, Thanks for the links. Will look at and read in due time! I think it’s rather unproductive to look for the essential Boetticher in any of his contract films. There are always elements one can pick out that show up in his later, more personal work, and perhaps certain technical flourishes, but the Ranown films are so well done that they seem like the work of a whole different filmmaker. We can get a bit carried away with the auteurist theory at times forgetting Hollywood was first and for most a Factory town then. I suspect the treatment of minorities was largely from the writers though supported by directors and producers. There is some guilt raising its head around this time about past treatment of minorities, and a new sensitivity was general and far from unique. For that matter many minorities were well represented in films from the thirties on. It wasn’t all Stepin Fetchit and Mammy from GWTW. Hispanics may have been clichéd but were generally well portrayed even before the propaganda effort and all those South American films during the war. Even Native Americans became people and no longer a force of nature as in earlier westerns. I sure he had fairly free reign within some constrictions. Re Mammy in Gone With The Wind. I could not disagree more. 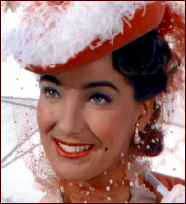 That film is populated by fools but there are in fact three characters who are not: Rhett, Melanie and Mammy, and of the three, Mammy is the strongest and wisest. The rest, from Butterfly McQueen’s Prissy to Laura Hope Crews Aunt Pittypat, and most of those surrounding them, are folk to avoid. The black characters, however, are all treated with dignity and respect. Big Sam rescues Scarlet from her foolishness, etc.